With as much as 503 horsepower on tap, it can sprint to 60 in just 3.7 seconds. What’s as quick as an AMG GT Roadster but has room enough to seat five? 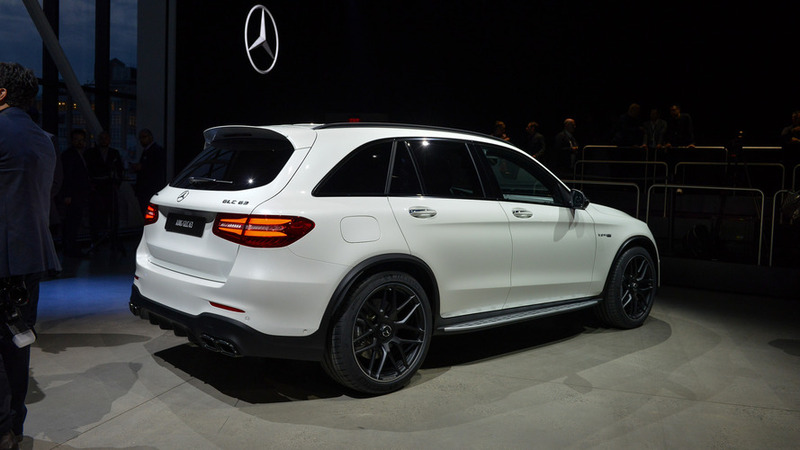 You’d be right if you guessed the new Mercedes-AMG GLC63. Germany's latest super-SUV comes in four different trims: the standard GLC63, the sporty GLC63 Coupe, and the more powerful GLC63 S and Coupe S. They’ll all be on display at the New York Auto Show this week. 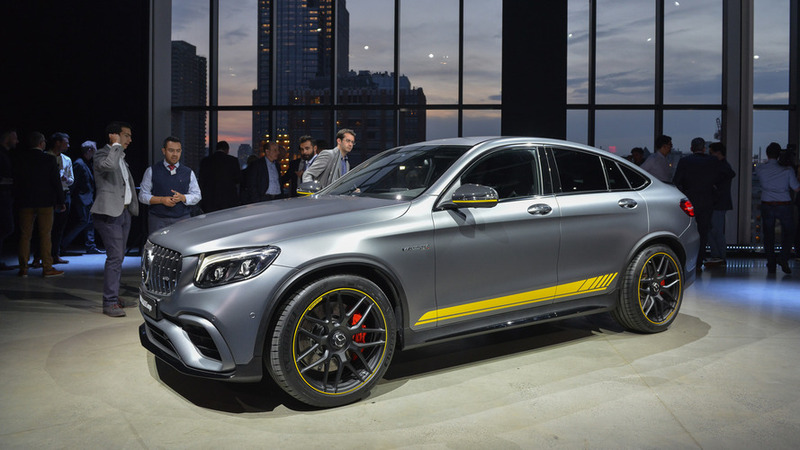 The lineup uses a 4.0-liter biturbo V8 that produces anywhere from 469 horsepower (350 kilowatts) and 479 pound-feet (649 Newton-meters) of torque, to 503 hp (375 kW) and 516 lb-ft (700 Nm) in the hotted-up S trim. 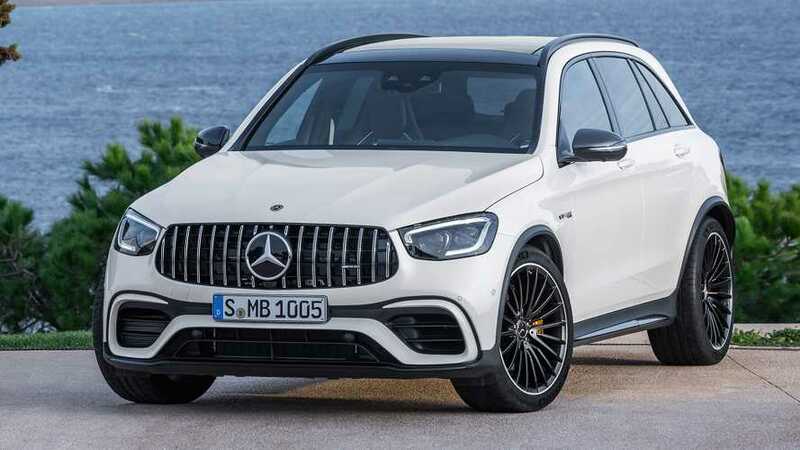 The standard GLC63 and Coupe can hit 60 miles per hour (97 kilometers per hour) in just 3.9 seconds, while the S trim models can do it in just 3.7 seconds. Well within supercar territory, the whole lot of them. 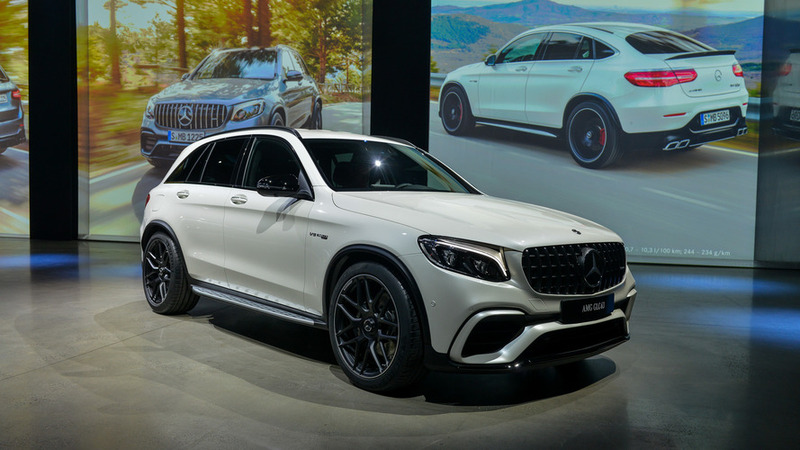 Both version of the GLC63 use a nine-speed automatic gearbox, and power is sent to all four wheels via the latest 4MATIC+ all-wheel-drive system. A new three-chamber air suspension and adaptive dampers help keep the ride under control at high speeds. 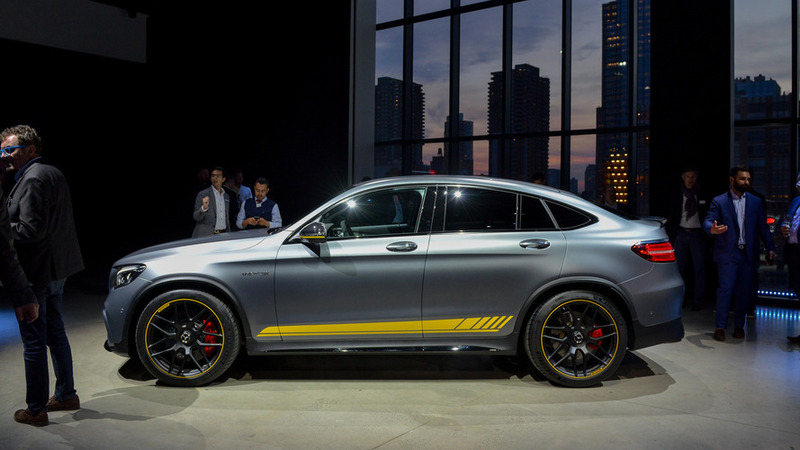 All that extra performance is aided by an aggressive set of new design cues, which sees additions like 19-inch wheels on the GLC63, and 20-inch units on the GLC63 S Coupe. 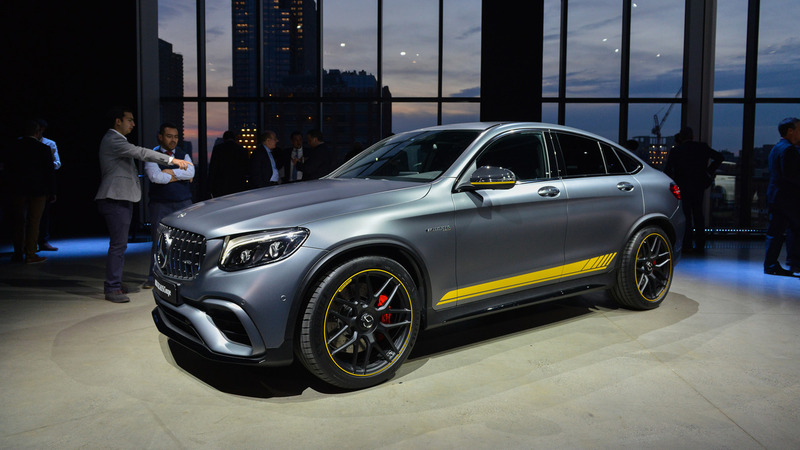 Sculpted diffusers have been added to the front and rear, while quad exhaust tips, and an optional AMG Night package that uses high-gloss black features on the front splitter side sill inserts, and mirrors, gives it a sportier look over the base model. The interior sees much of the same upscale updating, including Mercedes’ MB-Tex man-made leather covering nearly every inch of the cabin, and an AMG Performance steering wheel available on the GLC63 S Coupe. For a few bucks extra, buyers can upgrade to true Nappa leather throughout by ordering the optional AMG Performance Studio interior. 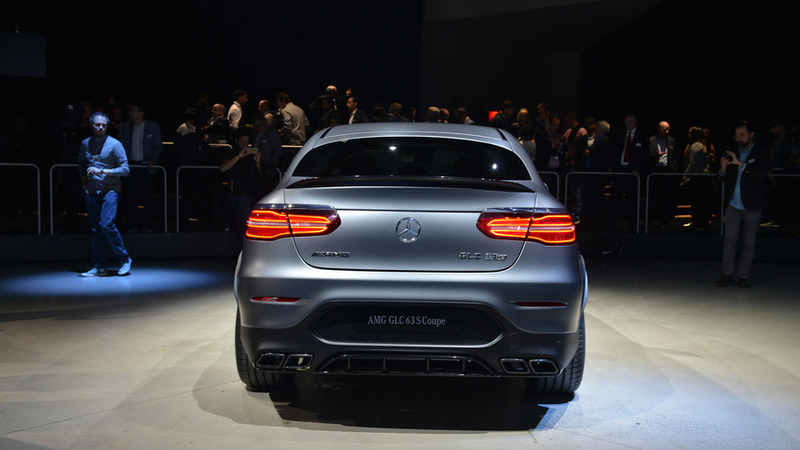 The new GLC63 and CLG63 Coupe is on display now at the New York Auto Show. Check out all the live photos in our gallery below.